When a local store had pineapples on sale, I decided to take advantage of the great price. I bought 4 of them. I knew I could never eat them all fresh. I bought them with the intention of canning them. Why bother to can? 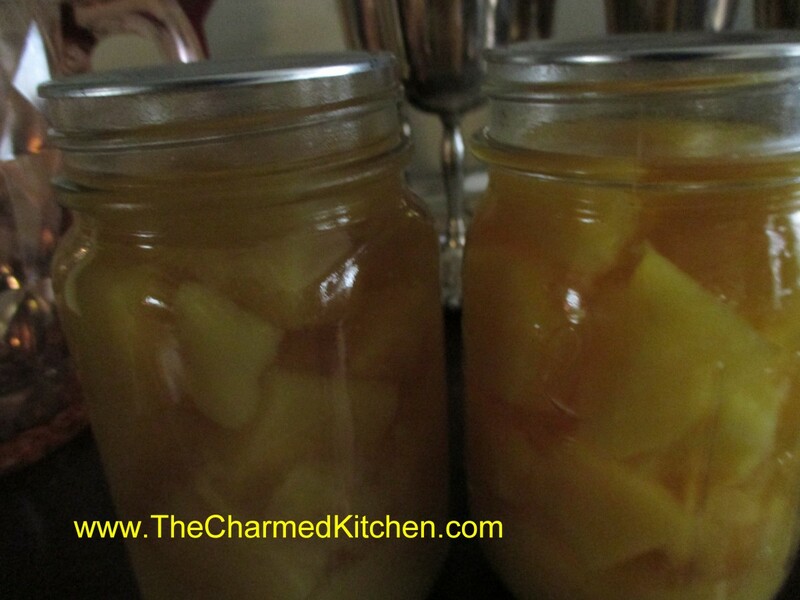 I just love the way pineapple tastes when canned in jars, as opposed to being canned in cans. I suppose when you factor in my labor, it wasn’t much of a savings, but I still think canning them is worth my time. They ended up costing me about 5o cents per pint. Certainly a savings over the cost of canned. But sometimes, it isn’t about just the cost savings. It is about the quality of the final product. I can mostly seasonal, local fruits and veggies, so I can extend the season, so to speak. Pineapples aren’t exactly a local crop here in Ohio. But they were on sale, so I used the moment to stock up a little. Pineapples are pretty easy to can. I am so glad I did it. Now, when I want pineapple for a recipe, I just have to get them out of the cupboard. So here is the recipe. Wash, peel and core pineapples. You can cut the pineapples into one-inch cubes or into half-inch thick slices. Use just enough water to keep pineapple from scorching and simmer together until pineapple are heated through. Heat up pineapple juice to a boil. Ladle pineapple cubes into clean, hot jars. Ladle in hot juice. Leave half-inch headspace. Remove any air bubbles with a non-metal utensil. I use a small plastic knife. Wipe rims and screw on lids, fingertip tight. Place jars in canner of simmering water. Make sure water covers jars by at least an inch. Bring water to a boil and process jars 15 minutes for pints, 20 minutes for quarts. 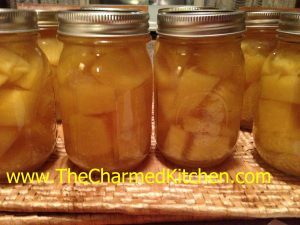 When processing time is up, turn off heat and leave jars in canner 5 minutes, before removing to a draft free area to cool. Yield 8 or 9 pints, 4 quarts. 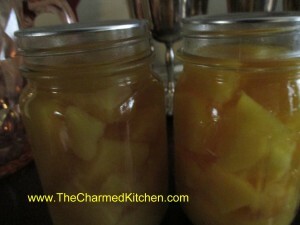 In a canning class a few weeks ago I shared some home canned pineapple with the students. I had promised to share the recipe. It is really simple to do and a great way to take advantage of a good sale. I found pineapples on sale for a dollar and grabbed quite a few. I canned them in juice although you can use a light sugar syrup, if you prefer. I think they look and taste great. Here is the recipe. minutes. Fill hot jars with hot pieces and cooking liquid, leaving 1/2-inch headspace. Remove air bubbles and adjust headspace. Wipe rime with dampened paper towel and apply lids and bands. Process in a boiling water bath. Pints 15 minutes, quarts 20 minutes. Altitude adjustment- 1,001-6,000 ft. pints 20 minutes, above 6.000 ft. 25 minutes. Quarts 1,001-3,000 ft. 25 minutes, 3,001-6,000 ft. 30 minutes. Above 6,000 ft. 35 minutes.